Why do a Brickfields Heritage Walk? It has to be said that Brickfields is not the most fashionable area of Kuala Lumpur. This predominantly Indian enclave may lack the grand heritage buildings found elsewhere in the city and it is true that parts of the district are rather run down. 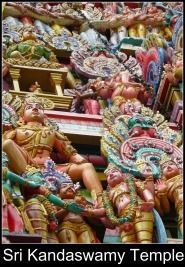 But the streets known as Little India have recently had a major facelift and elsewhere in Brickfields there are interesting churches, temples and shrines to liven up the rows of pre-war shophouses. 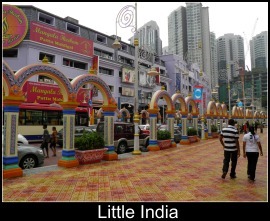 Kuala Lumpur City Hall runs a Little India @ Brickfields Guided Walking Tour every 1st and 3rd Saturday of the month starting at 9:30am from in front of the YMCA. Anyone can join one of these free tours. The timing was not convenient for me so I did my own tour covering much of the same sites. This is what you can expect to see if you decide to follow my Brickfields Heritage Walk. A convenient point to start the tour is KL Sentral, Kuala Lumpur's main transportation hub built in 2002. Clay pits and brick kilns used to line the railway tracks here which gave the district its name. There is not much heritage in evidence in this modern building so exit the terminal on the south side and make your way to Jalan Tun Sambanthan. 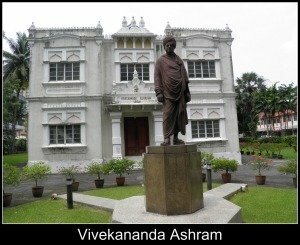 The first attraction is Vivekananda Ashramconstructed in 1904. This elegant whitewashed building with Moghul style embellishments was named in honour of the Indian spiritual leader Vivekananda who visited Malaya in 1893. His statue stands in front of the entrance. There was a move to demolish the building in 2004 to make space for a condominium project but protesters demanded that it be protected as a heritage site instead. I am not sure of its current status but it is still being used for spiritual education classes, prayer meetings and so on. It is in need of a lick of paint but otherwise appears to be in good condition. The neighbouring streets of Jalan Rozario, Jalan Chan Ah Tong and Lorong Ah Tong are lined with neat rows of terraced housing known collectively as The Hundred Quarters. 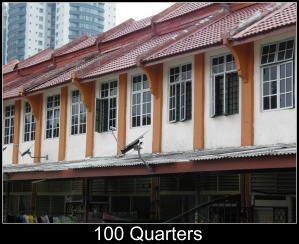 These 100 Quarters were built in 1915 to house civil servants (some sources say railway employees) who were brought over from India by the British during colonial times. Continuing the Brickfields Heritage Walk along Jalan Tun Sambanthan, past florist shops selling garlands of fragrant jasmine and other colourful blooms, brings us to the brightly painted Little India District which was recently given a new look and inaugurated by the Prime Ministers of India and Malaysia on 27 October 2010. The makeover included construction of an elaborate fountain supported by elephant statues, a grand entrance archway, brightly coloured pavements, ornate street furniture and a gaudy paint job on the buildings lining the two main streets. The overall effect is quite distinctive and pleasing. The area is full of the sights, sounds and smells that you find in other Little India districts elsewhere in Malaysia such as parlours offering bridal beauty treatments, general stores brimming with incense sticks, kitchenware and other products sourced from India, shops selling saris, jewellery, Pooja altars, Hindi movies, Bombay Mix and sweetmeats, Tamilan internet cafes, curry shops, sugar cane stalls and more. 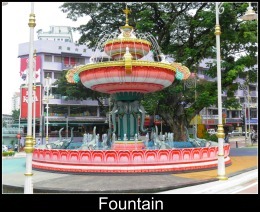 Brickfields is often called a Divine Location and seems to have more than its fair share of places of worship from different faiths and after leaving Little India, the Brickfields Heritage Walk passes a whole succession of them. First I took a quick look at the Orthodox Syrian Church's Cathedral of St. Mary the Theotokos. As it was Sunday the congregation was gathering outside dressed in their colourful saris and Sunday best. 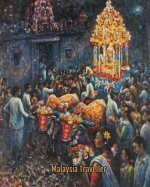 What a complex world we live in - Malaysians originating from southern India worshiping in a Syrian church with Greek saints! 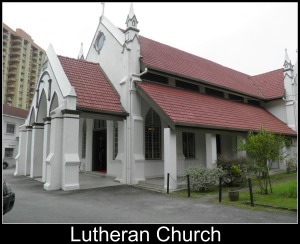 I then passed the Catholic Our Lady of Fatima church and, further along Jalan Sultan Abdul Samad, the Evangelical Lutheran Church which dates from 1924. This church would probably have been established to compete for the souls of the area's Tamil community. Nowadays, with a large migrant worker population in Kuala Lumpur, the church has new target markets and a bus-load of Indonesian female migrant workers turned up for the 1pm service in Bahasa Indonesia while I was taking my photos. I sometimes forget that Indonesia has a large Christian population. The nearby Tamil Methodist Church, established in 1896 (though the present building dates from the 1960s), has a similar role and I noticed that they perform services in Nepali, Indonesian, Telugu and English as well as in Tamil. Jalan Berhala means Shrine Street and on this road the Brickfields Heritage Walk passes more places of worship. 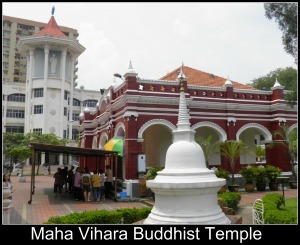 The Maha Vihara Buddhist Templewas founded by the Sinhalese community in 1894 but on my visit the devotees seemed to be mostly Chinese. In the grounds of the temple is a Bodhi tree grown from a cutting taken from the sacred Bodhi tree in Anuradhapura, Sri Lanka which I remember visiting many years ago. 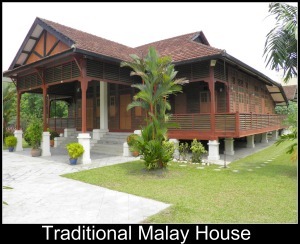 Opposite the temple is a magnificently preserved traditional wooden house in Malay style. It is a pre WW2 house and the whole street was once that design. The house was occupied by the parents of a Malaysian tycoon who has since restored it and keeps it for private use. On the next corner is the Temple of Fine Arts, an imposing modern building completed in 2008. The role of the TFA is to help the younger generation of Malaysian Indians to remain in touch with their Southern Indian cultural roots and traditions. It houses function rooms and performance venues. 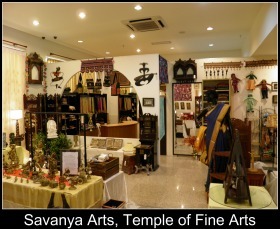 On the ground floor is a smart Indian restaurant called Annalakshmi and a shop selling Indian gifts and handicrafts, Savanya Arts. Taking the next right down a slightly scary-looking alleyway I visited a modest Chinese temple Seng Hong Tokong and the adjacent Shri Krishna Shrine. The humble Seng Hong Temple grounds include another Hindu shrine, Om Sri Maha Kaliamman Alayam, side-by-side with a Buddhist shrine (only in Malaysia!). The temple also advertises a herbal steam bath - a tiny sauna room where herbally infused steam is said to cure ailments such as arthritis and skin complaints. I did not try it as I was sweating enough already from my walk. 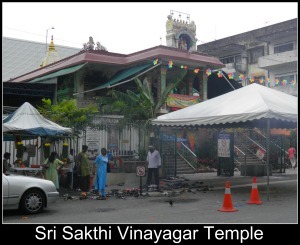 Further along Jalan Berhala, located next to a night market venue, is yet another Hindu Temple Sri Sakthi Vinayagar Temple. The Brickfields Heritage Walk rejoins Jalan Sultan Abdul Samad, passing the Madrasathul Gouthiyyah Surau, a mosque and madrassa built in the 1980s catering mostly to Indian Muslims. 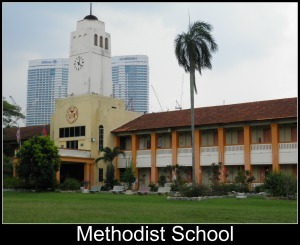 Across the street is the Methodist School which apparently dates from 1950 although some of its buildings look much older. On the opposite corner is the Malaysian Association For The Blind complex. I noticed a lot of blind people walking unaccompanied around Brickfields aided no doubt by those yellow bumpy tiles set into the pavements as well as their familiarity with the neighbourhood. A number of them must find work in the many Blind Massage Centres which can be found in Jalan Thambypillai particularly. Apart from the Blind Association, I noticed other organizations in Brickfields serving the deaf, mentally handicapped, paralympians and son on. This must be a side effect of being a 'Divine Location' with so many public spirited religious people around. From here Jalan Tabing tracks alongside the Klang River and underneath the monorail tracks. At the end of the street is the impressive Sri Kandaswamy Temple, built in 1902 by Ceylonese Tamils in a design inspired by the Nallur Kandaswamy Temple In Jaffna. Turning onto Jalan Scott, the Sri Veera Hanuman is under reconstruction. Further up the street is the Wei-Ling Art Gallery which looked interesting from the outside but since it was Sunday it was unfortunately closed. My Brickfields Heritage Walk headed back towards KL Sentral, passing along Jalan Padang Belia (where the YMCA is located) before turning into Jalan Thambypillai. 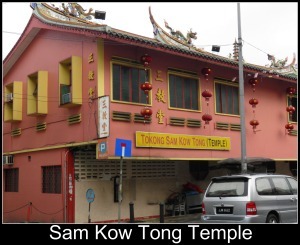 Here I noticed the 1950s era Sam Kow Tong (3 teachings) Temple sited right next door to some squalid-looking red-light establishments. 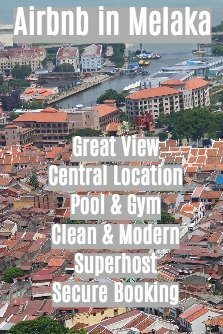 Despite being a 'Divine Location' it would seem that immoral activities still thrive in Brickfields, an area which also has quite a number of betting shops and more liquor shops than usual selling extra strength beers (12 percent alcohol) of brands that you have never heard of. In Brickfields, as in life, vice and virtue live side-by-side. For food there are, as you would expect, a large number of Indian restaurants on the route of the Brickfields Heritage Walk. Restaurant Nagas and Restoran Chat Masala, both on Jalan Tun Sambanthan are supposed to be good. If you prefer home-cooked Chinese food, opt for the highly rated one-dish-meals at Sin Kee Restaurant, 194 Jalan Tun Sambanthan. That completes my Brickfields Heritage Walk. I hope you try it and enjoy it. The distance of my suggested route is 4.75km and I spent about 3 hours here in total including a meal break.